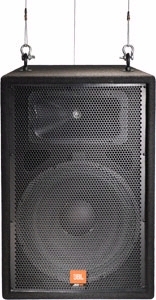 The JRX115i is an economical, suspendable, fifteen-inch, two-way speaker system designed for installation where ground stacking or pole mounting is impractical or undesirable. The JRX115i is well suited to a variety of sound reinforcement applications including live music, music playback and speech. Other than the substitution of three, threaded M10 suspension points for the handles, feet and pole-mount, the JRX115i is identical to the popular JRX115 portable sound reinforcement speaker.